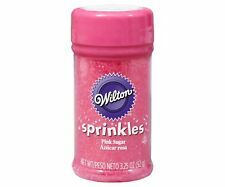 WILTON ~ SPRINKLES Sanding Sugar ~ PINK ~ 3.25 OZ. Everything about these gold and white sprinkles say "Celebrate!" Perfect for wedding, anniversary, and New Years Eve party treats. Includes gold sugar, gold/white sugar pearls, white jimmies, and white sugar. 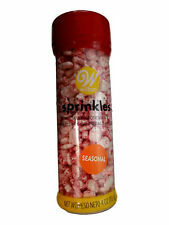 Assorted sprinkles are in an easy-pour flip-top bottle. Certified Kosher ✷ made in a facility that also processes wheat - contains soy ✷ Made in China. Wilton Edible Glitter adds a glimmering touch to treats. Perfect for use on iced cakes, cupcakes and cookies or sprinkle on drinks for twinkling toasts. Thousands of pieces in every jar. Certified Kosher. Gold Stars. SILVER PEARLIZED SUGAR SPRINKLES. These edible iridescent sprinkles. SILVER PEARLIZED. FANTASTIC FINISH TO YOUR CAKE ! PERFECT FOR DRESSING CUP CAKES, CAKES AND INDIVIDUAL TREATS. Wilton-Pearlized Sprinkles! Give your cakes cupcakes cookies and more a little flourish! This package contains one 5 ounce resalable container of pink Sugar Pearl Sprinkles. These edible iridescent sprinkles add stunning accents to your baked treats. Add the soft shimmering look of sugar pearls to your treats. Wilton Cake Sequins - Gold 283g (10oz) Ready-to-use Cake Sequins add the elegance of gold to wedding and celebration cakes. Attach to the cake before icing is set, this works best with buttercream or other frosting style icings. Six fun shapes and colors to energize your goodies! Flip-top bottle lets you shake or pour in just the right spot. Certified Kosher. Extra fine sugar is excellent for filling brightly colored designs on cakes, cookies and cupcakes. Controlling the flow is easy with the flip top shaker bottle. Certified Kosher. 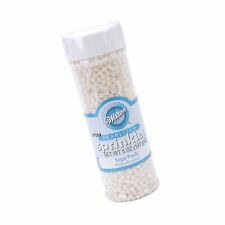 Add a decorative finish to cookies, cupcakes, cakes and other sweet treats with Silver Sugar Pearls. Certified Kosher Pareve by the Chicago Rabbinic Council. Silver Sugar Pearls, 4.8 Ounces by Wilton. This listing is for one 3 Oz bottle of shiny black green and purple Wilton sprinkles. They are brand new sealed in the original packaging. 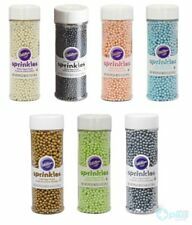 The dark spooky colors make these sprinkles great for Halloween cookies/ baking. Shipping to US only. YELLOW SPARKLING SUGAR SPRINKLES. These edible iridescent sprinkles. FANTASTIC FINISH TO YOUR CAKE ! COLLECTION IS ALSO AVAILABLE FROM OUR ST17 WAREHOUSE. DESPATCHED WITHIN UK MAINLAND ONLY. Orange, Yellow & White Ghosts Sprinkles. Orange & Silver Skulls Sprinkles. Wilton HALLOWEEN. Glass Bottle w/Spoon. 3.6oz each. Add golden accents to your next dessert — choose Wilton Gold Sugar Pearls to decorate your iced creations. Certified Kosher Pareve by the Chicago Rabbinic Council. Gold Sugar Pearls by Wilton. 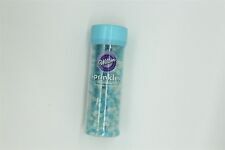 WILTON Dark Green Sanding Sugar SPRINKLES 3.25 OZ. ~~ SPRINKLES ~ Green ~~. Size ~ 3.25 oz. ITEM GBC/wilton/greensprinkles. SALE!! WILTON Lavender Sanding Sugar SPRINKLES 3.25 OZ. Size ~ 3.25 oz. ~ 92 g. SALE! Add borders or shapes, make 3-D quilled shapes and bows, add details with FoodWriter Edible Color Markers or Wilton Icing and Gels. FANTASTIC FINISH TO YOUR CAKE ! Contains sucralose and sugar. Sanding sugar is fine grain sugar. Use for cookies, cakes, stencils and more. Can also be used for the center of a calla lily when making the lily from gum paste or clay. 3.25 ounce bottle. Certified Kosher.